We are happy to invite you to chamber classical concerts at splendid premises of the Spanish Synagogue located in Josefov, Old Town of Prague. You will hear Ravel´s Bolero, famous opera and musical melodies and Jewish melodies performed by the Czech Collegium Chamber Ensemble. Soprano Michaela Šrůmová guarantees a pleasant artistic experience. The soprano Michaela Šrůmová is a member of the National Theatre Opera in Prague, where she is valued not only for her velvet voice and musicality, but also for her great versatility. 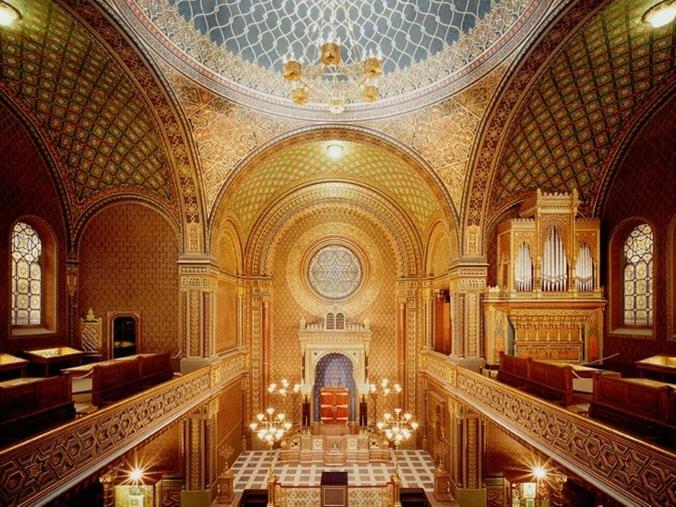 If you want to know more about Prague´s synagogues, concert halls or Prague´s churches, see our List of Venues! concert très bien, on ne voit pas trop bien les musiciens cachés par une barrière. It was a very joyfull concert, the singer and the instrumental cinquet were excellent. Concert magnifique dans un cadre superbe. Nous avons apprécié la qualité et la variété des pièces jouées lors de ce concert. Une excellente façon d'approcher la musique classique et moderne pour les neophytes que nous sommes. Un de nos meilleurs moments à Prague. Goid selection of music. Soloist was outstanding but the chamber group more ragged. The cellist was too dominant. Très belle soirée. Talent exceptionnel, chaleur et proximité. Superb ensemble. Passionate performances in an incredibly beautiful, poignant setting. Soloist soared to the highest notes effortlessly, rendering the songs with charm and wit.an utterly delightful evening, not to be missed. Úžasné místo a velmi profesionální projev jak orchestru, tak sólistky M. Šrůmové vytvořily z tohoto koncertu nezapomenutelný zážitek. Díky za to. Première fois pour moi et je peux dire que j'ai été comblé. Le cadre est somptueux et les musiciens ainsi que la soprano sont impressionnants. Fabulous venue great acoustics. Ideal for a snapshot of different genres of music without sitting through an entire opera. The venue is spectacular - beautiful with great acoustics. The musicians were all great, and Carmina Burana has a beautiful voice that truly sounds like a musical instrument. The songs and the flow of the program were selected with a good taste. The musicians were excellent although the soprano sounded not all the time aligned with the rythm of the music. This was the second time I was priveleged to attend the Czech Collegium event t the Spanish Synagogue. This event is seamless from beginning to end. The music and vocals hypnotize you into a state of beauty. Amazing concert, beautiful music and venue. A very special experience. This was a wonderful performance, and we are very happy that we went. The musicians and the vocalist were great, and the acoustics in the building were so lovely. The amount of time for the show was very good for us. Nous conseillons fortement ce concert dans un lieu magnifique. Les musiciens et la soprano nous ont fait vivre un moment très agréable, malheureusement trop court. Great location and excellent performance by the artists. I wished the concert would have been a bit longer than just an hour. We booked this concert from Scotland in advance of our trip to Prague. Found it easy to book and pay online. Thoroughly enjoyed the concert which had a really good mix of music genres. A nice length of concert at one hour long although I could have listened for much longer! Outstanding performances from the musicians and Soprano soloist. Varied and interested programme. Would highly recommend. This was our first venture in to light classical music. We were not disappointed. Most people would be familiar with the majority of the selected music - thus our choice. Venue was stunning. Acoustics, fabulous. Bolero - the performance was breathtaking. Disappointed that some patrons chose to disregard the signs saying no photographs and no recordings thus causing distraction for those around them. Amazing accustic. Concert is a very greate. Many thanks. Sure, if possible, will repeat. The musicians were talented and energetic--the soloist, the base and the first violin stood out as excellent. The program of music was chosen well, the combination of Spanish pieces and Jewish traditional pieces fit the venue. The one piece that did not fit very well was the show tune from Evita the movie--not really in the same class and category as the rest of the music, neither Jewish nor Spanish, and it did not make sense with the other pieces in the program. Not only did the Czech Collegium perform Carmina Burana and Bolero but also performed a mixed of other songs. Enjoyable event!